Unsheathe your swords. Unleash your dragons. The Queer Trivia Night is coming. Calling All Kings And, Well, Queens. Unsheathe your swords. Unleash your dragons. The Queer Trivia Night is coming. This is your chance to engineer your battle plans like the Boltons, pore over the enemy’s strategies like the Baratheons, and draw up your maps to victory like G.R.R’s bank account. We’re back with Can You Repeat The Question? Like all the GoT characters who’ve died and become White Walkers. Muahahaha. And the categories this time will be Queer Quotient, Know Your Gay Celeb, Sashaying Singers + Faggoty Films & Master of Thrones. And a special jackpot question for which we have no prize: Is Jon Snow still alive? 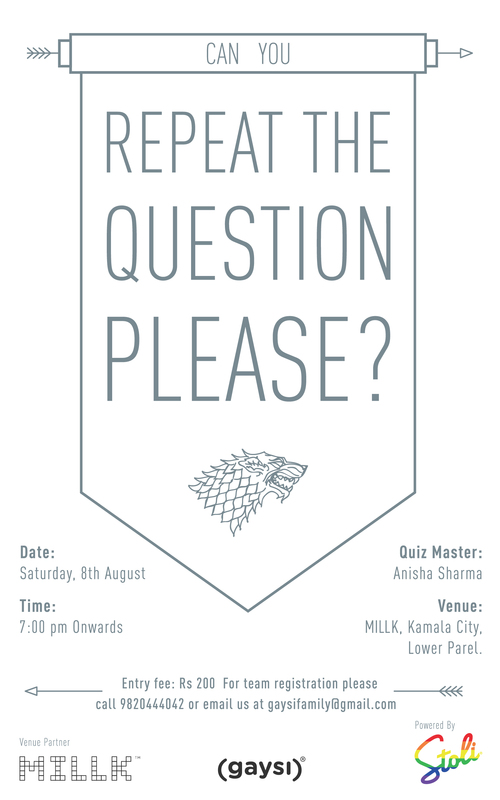 Hosted by the fabulous Anisha Sharma *cue direwolf whistles*, this night promises to be more shocking than the Red Wedding. (Or maybe not. Doubt anything can top that.) And post the battle, when we have only the last team standing, we’ll kick off an after party you may not want to miss. So gather your troops for the #Epic battle. Your armies must be no smaller than 3 foot soldiers and no bigger than 5. Register your clan by writing in at gaysifamily[at]gmail[dot]com, and give yourselves a glorious name too. Remember, no warging into the host allowed if you don’t know the answer! Battleground: MILLK, Kamala Mills Compound, Lower Parel, Mumbai. Teams: Minimum 3 to Maximum of 5 players per team. Register your Team Name & Members by emailing (gaysifamily[at]gmail[dot]com) us. No Team? We have Singles Question Round too! LGBTQS Productions Presents Dirty Talk 6.0! Jai Ho(rror)! : All Queer, All Bollywood, All Night! Salvation Star & TimeOut Mumbai present MUMBAI PRIDE NIGHT 2012!